ARE YOU READY GUYS?! DON'T SLACK OFF!! 1. This is NOT a standalone movie, this is a SEQUEL to Sengoku Basara 二, which in turn is a Sequel to Sengoku Basara. Though you can watch this first as it gives short synopses of the first two. but you will eventually have to watch those for this movie to make sense. 3. If you are looking for realistic war battles, this movie (heck, series) IS NOT FOR YOU. People do, and WILL constantly do increasingly impossible (and awesome) feats. okay, with those out of the way, let's get it on! Sequel to Sengoku Basara 二, this movie starts off with a "what happened after" style story telling. We get to see how the previous war affected the protagonists' faction on each of their POV. "Cameo Factions" of side characters are also given less focus too, so there's no filler in this movie. The story is mainly told in a character centric way. The plot itself, however, is the typical "tyrant trying to conquer a country" plot. It's pretty cliche yes, But is nonetheless still engaging due to the sheer awesome of the characters. who are all pretty well rounded. Character Design is pretty top notch. Everyone looks very modern yet still feel like they really are from the Sengoku Era, though it's mostly the mooks who look that part. 3D special effects look pretty integrated too. The animation is pretty smooth and the environment (even barren ones) look picturesque. Buildings and Transportation are very detailed. There's also a nice surprise at the credits, one of the few times you WILL want to watch the movie credits. Epic fighting scene music? check. | Mood fitting music? check. | Good Opening/Closing credits music? quadruple check. Overall, the music here are all very fitting; there's the hard rocking music for fighting scenes and op/ed; there's the slow and serene music for the more serious scenes; there's the epic ominous music with latin-like chanting for when people are fighting the more sinister lot of the cast. Music aside. another strong point of this movie is the voice acting. (or at least, japanese voice acting) The characters that are meant to be Loud and Compelling are exactly just that. soft spoken characters are also appropriately soft spoken. NO ONE will make you feel like they sound off. It has always been even in the 1st Sengoku Basara. Character development HO! previously well developed characters are given even more development here. previously "Mr. I-Appeared-in-the-last-episodes" types are also fleshed out via showing previously offscreen events. There are still unexplained recoveries though. but we can safely assume it's part of every single plot relevant main/supporting characters' many powers. That aside. everyone gets their fair share of depth and screentime depending on their importance in the plot. Characters who are there just to kick in the story are immediately put aside in the sidelines and never mentioned directly again. And oh, I just would like to add that some characters here are pretty crazy awesome and often have hilarious one liners which only emphasizes their awesomeness. The Sengoku Basara series is originally one of Capcom's FIGHTING game series. True to it's Fighting Game origins. there's A LOT of fighting in this movie and it's prequels. even if you can't care much about the characters or plot there's still the insane amount of action to keep you entertained. This is definitely a must watch for action fans. there's ZERO fanservice too, unless you count the the male characters sculpted bodies and primal screaming during fighting fanservice. In closing. I really enjoyed the Sengoku Basara Series. This movie gives a damn satisfying ending. where the protagonists go have ONE HELL OF A PARTY. At last I watched this! 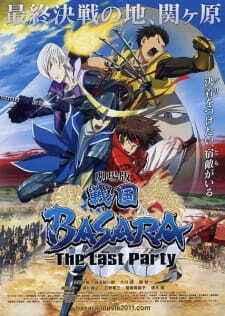 I realy love Basara's seasons and I think for those who realy true fans will understand what I mean. It is the Last party, but battle is not ended.I guess. So have good time and watch.I think you will enjoy! Don't come into the Sengoku Basara franchise expecting anything more than a battle oriented program that makes little boys, and this 21 year old boy, want to go out, buy six swords and spout strange statements in poor English. Now if you can get past the fact that this series, and the last party, is purely for a laid back, stress free roller coaster ride of adrenaline filled manliness, then you will come into it with the right mindset and be able to appreciate it fully for what it is; an incredibly fun movie to watch. The story takes place after the events of the first two series conclude (and for those who don't know, are loosely based on the real events and warlords of the waring states period) - I say loosely because while Date Masamune was in fact regarded as the one-eyed dragon of oshu, I'm about 70% sure he couldn't fly or shoot electricity out of his sword. So set between the defeat of Toyotomi Hideyoshi and the battle of Sekigahara, The Last Party is another adrenaline fueled fight fiesta featuring all of the characters we have come to love over the past two seasons; fighting the new threat Ishida Mitsunari, whilst deciding whether or not to throw in their cards with the real life eventual victor and ender of the waring states period; Tokugawa Ieyasu. As always, the art is superb, the voice acting is sublime and everything that has made this series noteworthy is transferred to this feature film. I won't say much about the show itself as fans know what they are getting into and those new to the series really should start at the first season. So all I can say that is if you want a fun and incredibly exciting movie to watch, and enjoy watching ridiculous samurai battles and physics defying feats of pure awesomeness, then this really is the show for you.